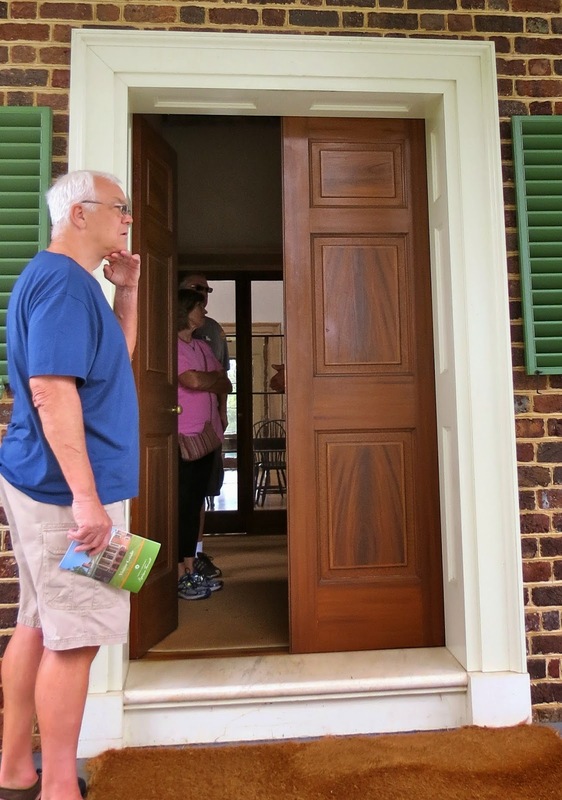 While staying at Otter Creek on the Blue Ridge, I took a side trip by car to Lynchburg, VA, to visit a place called Poplar Forest, Thomas Jefferson's well-kept secret. As you turn in the entrance road, you are transported back in time to the late 1700s, early 1800s. You can imagine Thomas Jefferson riding his horse down this lane. Thomas Jefferson and his wife, Martha, inherited the plantation known as Poplar Forest from her father in 1773. 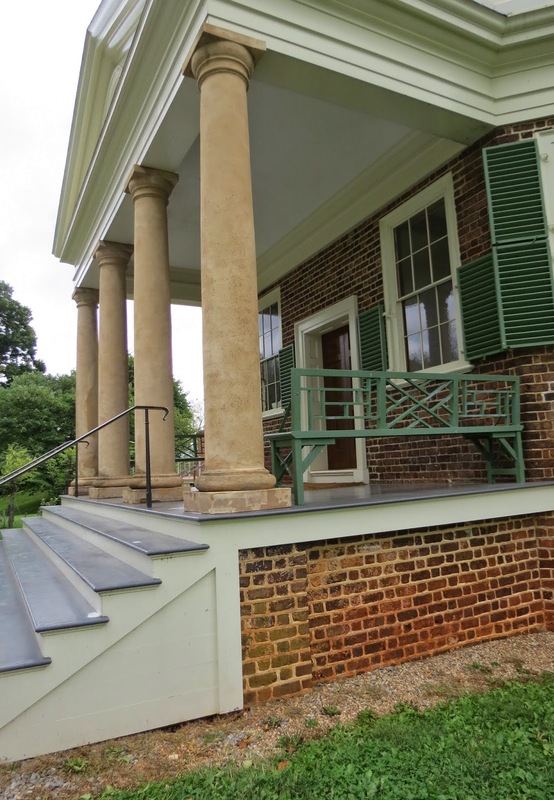 The plantation provided Jefferson with significant income and provided a perfect setting where he could retreat to pursue his passion for reading, writing letters, studying, and gardening after retiring from public life. He and his family eluded British capture by leaving Monticello and staying here for two months in 1781. They probably stayed at the overseer's house at that time. In 1806, Jefferson traveled from Washington to supervise the laying of the foundation for the octagonal house we see today. When his presidency ended in 1809, Jefferson visited the retreat 3 to 4 times per year, staying from 2 weeks to 2 months. He made his last visit in 1823 when he settled his grandson, Francis Eppes, on the property. Ill health prevented further visits. In 1828, two years after Jefferson's death at age 83, Eppes sold Poplar Forest to a neighbor. THe property was privately owned until 1983 when a nonprofit corporation began the rescue of the landmark for future generations. One of two "necessaries," or privies, also built in an octagonal design. THe 16th century Italian architect Andrea Palladio greatly influenced Jefferson's plan for his country villa at Poplar forest. He became fascinated with octagons because of their symmetry and the light and airy environments they created. Map of the grounds. In 1814, Jefferson added a 100-foot wing which included a kitchen, a smokehouse, one room likely used as the cook's room, a laundry and a storage room. The property's name, which predates Jefferson's ownership, reflects the forest that once grew here. Several stately poplars in front of the home still welcome visitors. The house is built of brick…both outer and inner walls. The columns are also made of brick and extend to the ground. The upper portion is covered with stucco. Specially shaped bricks were made for the corners to create the octagonal shape. The brick structure survived a fire that burned all the parts made of wood, and it is still being restored according to historical accuracy. No photos were allowed during the inside tour. One half of the house, including Jefferson's bedroom is being restored with historically accurate wall coverings and woodwork, etc. The other half is being left unfinished as it allows you to see the construction details. The basement that once held a wine cellar, now houses a museum. The kitchen, relatively modern for its time, with 3 stew stoves for French cooking and a set kettle for instant hot water. An innovative flat roof, called a terras roof, also served a recreational purpose. "About twilight of the evening, we sally out with the owls and bats and take our evening exercise on the terras." These 19th century tenant houses are now used for administrative offices. Archeological study has located the site of slave cabins, and an frame was constructed to depict the size and location of one. I have been to Monticello, but I had never before realized this place existed, so it was a very interesting find. Very neat find! I never heard of it either, but now I want to visit it. A very neat find.....it is not well known.